NAUGATUCK — When Naugatuck guitarist Bob Semanchik released his first album three years ago, listeners told him they liked his three original works better than the covers on the CD. Now they have a chance to hear more of Semanchik’s catchy voice on his new album, “16 Stories,” released in July. The CD features Semanchik’s slick guitar playing in 16 upbeat, pop-rock tales covering topics from technology to love. With clear influence from Paul McCartney with the Beatles and Sting, Semanchik said listeners have told him the album also invokes the sounds of Steely Dan and Tom Petty. Like the line from the band that influenced much of Semanchik’s work, he couldn’t have done it without a little help from his friends. Paul Opalach played base for four songs and drummer Mike Marble laid down the percussion over Semeanchik’s finished tracks. Chris Reba mixed 10 songs and played base on one song. “They just added a lot to the music. They brought it up a notch,” Semanchik. Semanchik produced his first album, “Standard Interpretations,” himself, but he wanted even better quality for his second album. With the help of Opalach at Long Hill Recording in Shelton, Semanchik was able to get his songs up to a higher level this time around, he said. When producing his second album, Semanchik said he went for something that was clean without using all the plug-ins and digital effects popular nowadays. “There’s not a lot of tricks on here,” he said about his second release. Semanchik said he wrote most of the songs on his new album either in Florida or on the way to Florida, where he vacations with his wife, Carol. “That’s the place where I can clear my head and not be working,” Semanchik said. Semancjik’s second album was a long time in the making. He started writing in October 2008 and laid down the first tracks in 2009. Recording began in January this year. Even though Semanchik layers each of his songs by playing several tracks, all the songs can be played live with just with an acoustic guitar, he said. “You don’t want to make the song so complicated that you can’t reduce it down to a guitar or piano,” Semanchik said. Music has been a part of Semanchik’s life since an early age. Semanchik started playing guitar in sixth grade and taught himself piano at his grandmother’s house by taking guitar cords and figuring them out on the piano. At Western Connecticut State University, Semanchik finally got a formal education on piano and a degree in music education. When he’s not recording albums, Semenchik teaches piano, base, and guitar from his home in Naugatuck and guitar and base at the University of New Haven. Semanchik’s schedule is also booked up with gigs. He plays occasional solo events and with the Bales Gitlin Band out of Branford, with whom he’s worked for 15 years. For Semanchik the music comes before the lyrics when he’s composing an album. For the last song on his latest album, “Hope,” Semanchik said he had the piano music for a long time but couldn’t come up with the lyrics. Then a student told him it should be a worldly theme. “Two days later, it just connected and I had the lyrics,” he said. For Semanchik, there is a story about each of his 16 stories and how they came about. The content of Semanchik’s work focuses on relationships with a positive overtone. The song, “Believe In” is about state of the world and wanting to find something positive with the political mess. “Too Much Information” is about dealing with getting older and keeping up with technology. “She has a real critical ear. She kills me on some stuff, especially the vocals. She forces me to be better and she doesn’t let me get away with anything,” he said. Now that his second album is finally finished, Semanchik said it’s nice to have a break. “I’ve had no weekends for practically three years,” he said. If he decides to start working on another CD, Semanchik said he’d first have to come up with a new concept. “I don’t want to just do the same thing again. … I’ve got to have something that makes it sound a little different so it doesn’t end up being 32 stories,” he said. 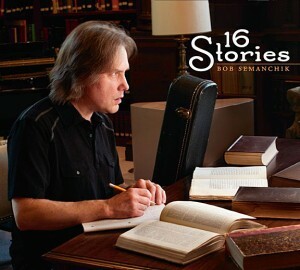 Semanchik’s latest release can be purchased on CD Baby and iTunes or at his website, www.bobguitar.com.